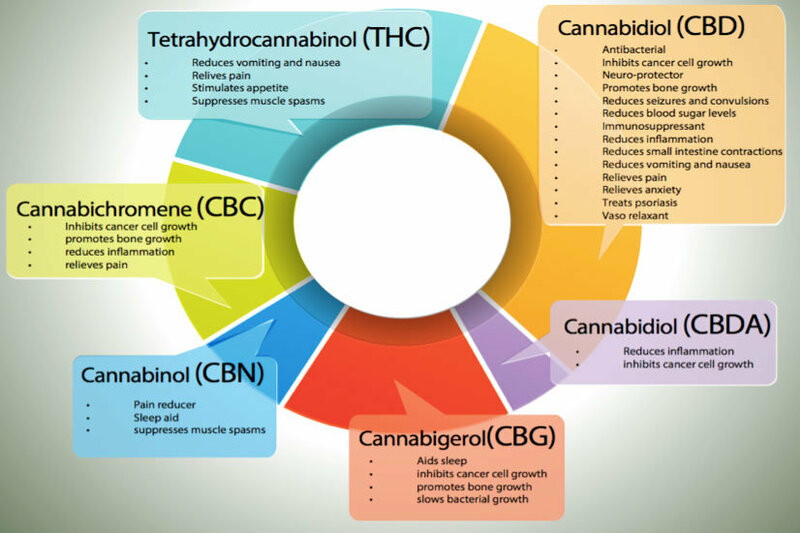 The above chart shows just a few of the mostly studied cannabinoids in cannabis. Cannabinoids are active chemicals in Cannabis that cause drug-like effects throughout the body, including the central nervous system and the immune system. They are also known as phytocannabinoids. The cannabinoids our own bodies produce are called endocannabinoids. The main active cannabinoid in Cannabis is delta-9-THC. Another active cannabinoid is cannabidiol (CBD), which may relieve pain and lower inflammation without causing the "high" of delta-9-THC. There are over 100 cannabinoids found in cananbis. Regardless of the activity of one cannabinoid, researchers have come to the conclusion that the WHOLE plant works together in what has been come to be known as the entourage effect. Cannabinoids may be useful in treating the side effects of cancer and cancer treatment, among many other medical conditions due to the endocannabinoid system which has been identified as a modulator for other systems in our body. Relieving muscle spasms caused by conditions such as multiple sclerosis, and tremors in Parkinson's Disease.